From the intricate world of indie to the roots of jazz and reggae, the origins of soul and the traditions of classic rock. A world of drum grooves! 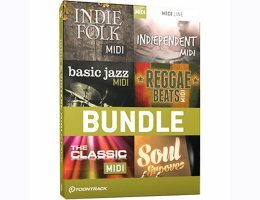 This bundle comes with six individual drum MIDI titles covering the essentials of indie, blues, jazz, classic rock and reggae. A wide and useful range of drum grooves – all expertly performed by top session drummers in their respective genres. From the Indie Folk and Indiependent MIDI comes a fearless collection of grooves that stray way beyond the conventions of drumming – off-centre, inventive and inspiring material that twists, turns and questions the traditional rock and pop defaults. Or in the words of of one of the drummers, Stephen Belans: "There is no law that says a drum beat requires eighth notes on the hi-hat – or even a hi-hat at all". The Classic MIDI has former Paul McCartney and Dire Straits drummer Chris Whitten revisit some of his biggest, classic rock hits while the Basic Jazz and Reggae titles take a deep-dive into an utterly opposite field of drumming – the roots and origins of jazz and reggae. Soul Grooves, on the other hand, explores the origins of soul – from the Motown heritage in the north, along the coast and crossing over the Mississippi delta to the deep south in Alabama. All in all, you get close to 2,700 individually played grooves covering a wide range of genres – a journey through what makes up the heartbeat of any great track. Start writing!